My name is Shirel Castillo I’m a sophomore at Oakland Unity High-school and in my english class we have been reading about artificial intelligence and at this point I’m in between whether or not robots will take over human power. One reason I’m on the positive side is that robots in the future might be a help for us. who ever builds these machines will make them as a purpose to help humanity. These robots can be our house guards, they can carry our grocery bags, drive us around, and even help us with personal house keeping. Now in days there are special machines that do human operations to reach into little holes that a human doctor can not reach and if you tell me that is pretty smart and helpful. Many people enjoy having technology and think it helps them and maybe it does a little bit and all that encourages big companies to create more new and advances machines. As an example the movie “I,Robot”, which had many robots created by a rich man in a big company and they were all created to help the society. In one scene there was a woman who was having an asthma attack on the side-walk and since every person owned a robot in their house the robot ran to get her purse and came back to the woman just to giver her her inhaler. This scene in the movie made me realize that maybe robots in the future won’t be all that bad if we think about it. Sometimes if you really think about these big companies or people who create all these machines just do it for their own good, to get more money and to feel superior than any other company because knowing that an invention a person created is being successful and being helpful to others in society will pretty much make them an important/famous person. But little do they know that everyone makes mistakes and maybe if they try to program a robot to be good there is no guarantee they have emotions and that they will actually be good. In the movie “I,Robot” the big machine named Vicky was in charge of all software and every robot created. Vicky misunderstood the three laws that were inserted into every robot and turned the robots into bad robots and started attacking humans and this smart machine was created by the smartest man. What this part of the movie explains is that all robots can turn against humans in the future at any moment even if the creator inserted laws into their hardware. 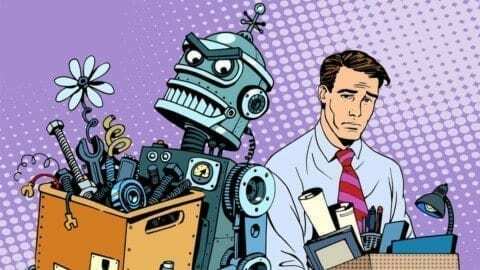 So pretty much my point is that even though robots in the future might help us somehow they will invade humanity because they will take all our jobs and power, they will pretty much be the new generation. Will Robots Enslave Humanity by Shirel is licensed under a Creative Commons Attribution-ShareAlike 4.0 International License. Robots, Beneficial or Life Threatening?Are robots going to be good or bad?